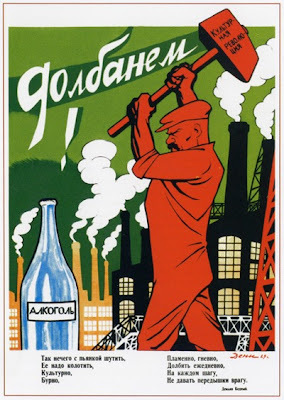 This is a beautiful anti-alcohol poster created by Victor Deni – who was one of the brightest soviet poster artists of the first half of the century. The poster shows a Red Worker standing in front of steaming factory pipes. He is about to smash a big bottle of alcohol. The giant hammer has words “The Cultural Revolution” written on. Unlike the Chinese Cultural Revolution of the sixties, which was a political struggle, the Soviet Cultural Revolution implied elimination of illiteracy, foundation of educational system, changing of private and social life of the citizens, development of science, literature and art under the supervision of the Party. Of course alcohol was considered to be the enemy of these reforms. I was really curious how will you translate "dolbanem". I think it is an important attribute of the poster that got lost in translation. Yep, it did take me some time to think it over. This is the best variant i came up with. All distilleries now caution to "drink responsibly." Just too many traffic accidents...one is too many. I'll admit; Stoli s a good product. Take a cab home, please. Wow, great poster. Is it actually on sale anywhere? I'd love to get a copy. I wish i knew, sorry ;) I have never seen it reprinted here in Russia, alas. May be you could check the galleries for the original. If you find anything i'll be most obliged if you could drop me a line about it. This poster is very interesting. Excellent concept. Illustrates perfectly the struggle of people against the capitalist vices. It is highly motivating. Congratulations on your blog. Greetings.